I am the hostess over @ Our Creative Corner this week. (super excited about that). And well, I have known for a l o n g time what I wanted to do. I already had the papers picked out, and the template laying on my craft table. And well, life got in the way, so I had to push that project aside and tackle some other pressing matters. But, I stuck in there, and finished it early this morning. So, the challenge for this week over @ OCC, is super easy and hopefully you have a grand time crafting! "I thought it would be fun to start off the new year with a gorgeous paper craft item, made with some pretty colors! The challenge this week, is to use 2 specific colors and a specific object. The main colors to use for your paper craft item (3-D item, a scrapbook page, a card, a tag, etc.) must be aqua and pink - and any shade will do! All neutral colors are welcome: white, cream, brown, black, and grey. And you must include a flower, any kind of flower. The flower can be hand-made, a stamp, a picture, a digital download, an accent, etc." 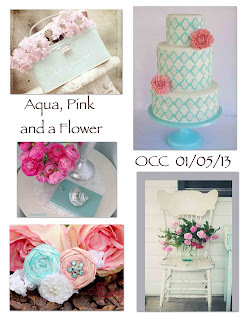 To help get you inspired, I created an 'Inspiration Board' that has some very pretty photos in it, with Aqua and Pink, and flowers! For this challenge, I decided to make a Card-Gift combo. Well, that's what I call them. They are a combination of a card and gift box. So, the front of this contraption is the front of your 'card', but when you open it, you reveal the 'gift box'! I just love making these! I used Aqua Mist cardstock (Paper Trey Ink) as my base. I just love this color. The blue is cool, light, and easy to pair with. 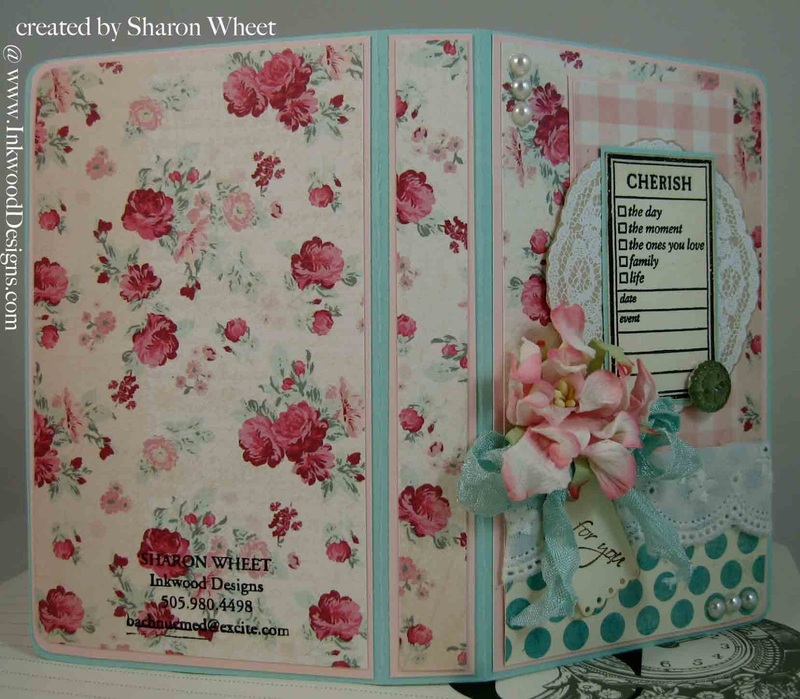 I then put matts of Blush card stock (Amuse Studio) on all three sides. I love this color of pink, because it is so soft in its color. 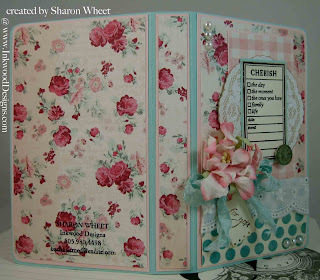 I used one of my all time pattern papers as the main panel, Blush (Lost & Found 2). I then added a white cotton trim to a dark aqua polka dot pattern paper to the bottom third of the front. The pink checkered piece is the back side of the floral piece. I also matted the pink checkered with Blush cardstock. The white doily is actually a stamp: Gossamer Lace (Stampin' Up!). I stamped this image in Versa Mark ink, onto a piece of Latte cardstock (Amuse Studio). I used ultra detail white glacier embossing powder and heat set the image. I used my detail scissors and cut it out. The 'Cherish' piece is a stamp: Cherish the Moment (Close To My Heart). I stamped this image in basic black classic ink (Stampin' Up! ), onto a piece of very vanilla card stock (Stampin' Up!) and then hand-cut this piece out. I matted it onto a scrap piece of Aqua Mist cardstock. I added little pieces here and there. I added 2 trios of faux pearls at opposite corners. I tied and added a multi-loop bow with Pool Party seam binding (Stampin' Up!). I added a soft pink paper blossom. I die-cut a tiny tag (Paper Trey Ink) from very vanilla card stock, and hand-stamped the 'for you' at an angle. I used a heart-shaped pearl brad (Reflections) to hold the tiny tag to the front of this little cutie. Finally, I added a round glass 'gem' (Jolee's Boutique) to the bottom right corner of my 'cherish' piece. 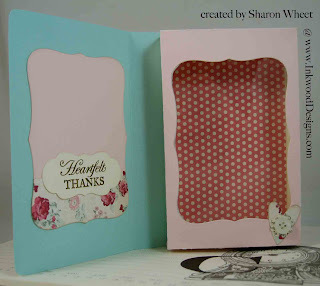 I used a Spellbinders die to cut the 'window' out of the box holder. The 'positive' piece it used as my 'note' area. I added a scrap piece of the same floral pattern paper to the bottom. I used my Lots of Tags die (Stampin' Up!) to cut the label piece. I hand-stamped the simple sentiment from a 'Winter' stamp set (Close To My Heart) in Soft Suede classic ink (Stampin' Up!). I added a little heart cut from the main floral pattern paper. I used some First Edition DSP (Stampin' Up!) and a vintage white button (Paper Trey Ink) to create the 'button flower'. 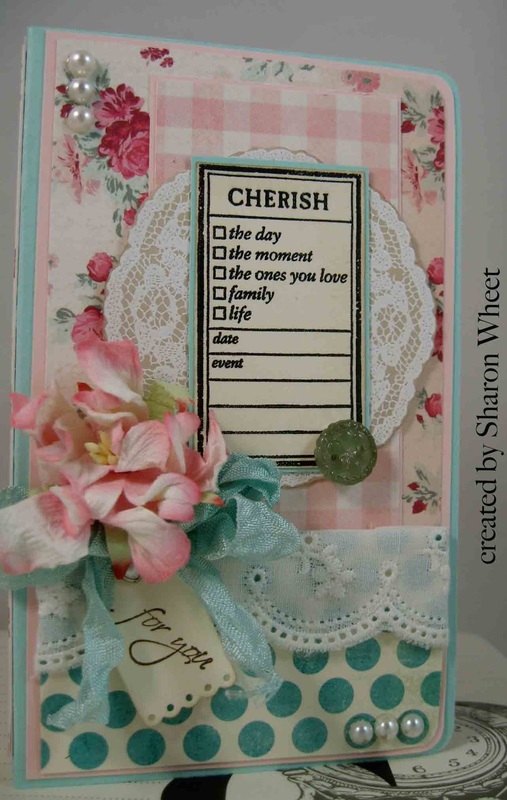 These little 'Card-Gift' Combo's are actually very fun to create. I purchased a template for this creation @ Creations by AR. I hope you have been inspired by our design team, and you get a chance to sit down and create something pretty using Aqua, Pink, and a flower! I hope you join us @ OCC. This is so beautiful, love the fabulous design and the paper is so pretty. LOVE it. This card/gift box is wonderful,and the way you have embellished and designed the box is beautiful, all your added elements create a feminine feel. I hope the recipient appreciates all the work you put into this. Great challenge.